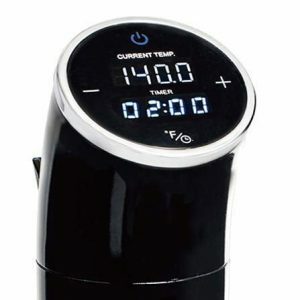 The Yedi Housewares Sous Vide is on the lower end for quality and has price that's much higher than comparable models. We recommend you pass on this model and consider the Anova Bluetooth Sous Vide or Wancle Sous Vide SVC001 instead. Size is larger than average. $89.95 Current Price - YOU SAVE $51.42. The Yedi Housewares Sous Vide is one of the lower end imported sous precision cookers. Compared to other models with similar features, it's very expensive and isn't a great value. The Yedi Housewares Sous Vide is $89.95 , compared to our second highest rated model the Wancle Sous Vide SVC001 for $87.99 which we feel is a much better value. This model is 16" in height which makes this model taller than the average of all the models we reviewed. it has a standard strength housing and a stainless steel tube housing for the heating unit. It has an alligator style clamp, which is easy to set-up and cleanup and put away, but it doesn't off a lot of flexibility for vertical adjustment. This model puts out 1000 watts of power, which is average for the models we reviewed. It has a flow rate of 2.1 GPM, which is higher than 2.0 GPM average for the models we reviewed. The high power on this model means you will have to be mindful of the water level for extended cooking projects. The high flow rate of this model means it will reach it's cooking temperature quicker than the average model we reviewed. We feel there are much better choices available and that you should skip over this model. For just slightly more money you can get our second highest rated model the Wancle Sous Vide SVC001 which is a much better value. We recommend the Wancle Sous Vide SVC001 instead. 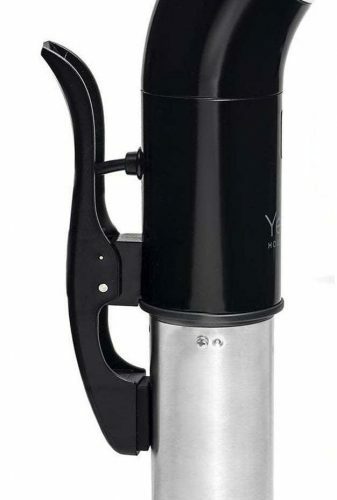 16" x 3.5" x 3.75" 11.1" x 14.8" x 4.5" 16" x 3.5" x 3.5"
The Yedi Housewares Sous Vide is below average quality and is more expensive than comparable models, we'd suggest passing on this model. The PolyScience Sous Vide Professional SVC-AC1B is made to be used in production line kitchens and restaurants it's way more machine than any consumer is ever going to need.